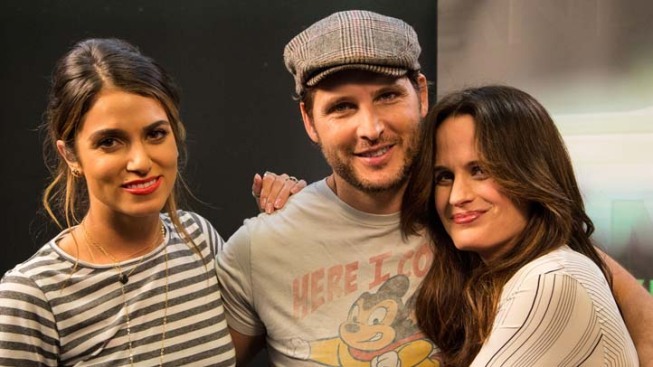 Nikki Reed, Peter Facinelli and Elizabeth Reaser look back on their unusual stint in the 'Twilight" spotlight. The sun’s going down on the “Twilight” saga, but Cullen vampires Peter Facinelli, Nikki Reed and Elisabeth Reaser are ready to bask in the final glow before darkness falls. The trio of actors had gathered with their many co-stars in San Diego for Comic-Con, on hand to tease their faithful legion of “Twi-hards” with snippets from "The Twilight Saga: Breaking Dawn, Part 2," the final installment in the saga adapted from Stephanie Meyer’s teen-lit phenom, and they even made a dusk appearance the night before their panel to give a thrill to the hundreds of devoted fans waiting overnight in line to glimpse them onstage. After their final trip to the Hall H stage, PopcornBiz sat down with Facinelli, Reaser and Reed to hear their thoughts about their waning days in the “Twilight” spotlight. Facinelli: Well, there's moments where we feel like – we were talking before that everyone up on stage in Hall H today was the last time you'll see the whole cast in one room together. Because even when we do press it's always split up, and it's kind of nice to have everybody on one stage. So there are moments like that that you think back and you're like, 'Oh' and you get nostalgic like that's a special thing. I'll never have that again. You get kind of…it's melancholy! But at the same time it's kind of like cool like that. Reaser: Well, then it'll REALLY be, like, over. Done forever, yeah. Reed: Which Peter's starring in, by the way. Unlike some of your co-stars, you three all had careers that were active before this franchise. But how has being involved in this whole experience – not just the job, but all of this – changed you, or kind of altered the course you're on personally? Reaser: For me I've made a real effort for it not to change me because I think it makes me feel…I mean, honestly I try not to attach myself to any of this, and as soon as I leave here it's like I'll never think about it again. I like try to just really focus on my life. For me it's like I just want to get another great job. So that's where my focus is on. So any time someone comes up to me or I'm reminded of this huge thing that I got to be part of it's always part of a surprise. Like being down there with the fans last night was a total shock to me, because I just don't really let myself think in those terms. And so weirdly, it's like a surreal thing for me. It's not really what my life is. Facinelli: It's becoming more in the past. There are fans that'll come up to me and they'll say, 'Hey, I loved you in "Fastlane," or 'I loved you in "Can't Hardly Wait". And now this is starting to become like that. It's like a part of me that is part of my movie career but that's not the bane of my existence. Whereas the last four years it's been the bane of my existence, because we've been completely in this bubble of making them and then promoting them; making them and then promoting them. So now you kind of dissociate yourself from it. And you're moving forward towards other things. Reed: I think for me, because you had just mentioned and said we kind of all had careers before this, it's not that it lessened – the whole experience is just as heightened, and I think just as exciting in a certain sense. I'll just use me as an example. I did 'Thirteen' and there was a moment in time where I was kind of important for a second. And then that goes away. And then you come back and do something else and then that goes away. And so you ride that roller coaster and you understand that it's all very temporary and fleeting, no matter to what degree. And so I think you have to keep that in mind that this is going on. Like great, I appreciate it. But I have distance because this is not my life. And this is not permanent. Facinelli: You can't buy into it because it's a moment of time. And then you go on, you do other things. Facinelli: I think none of us knew that it was going to be this big. But speaking for myself, I was very appreciative that it became this big. To be part of something that becomes a global phenomenon is rare. As an actor, you'll have things that certain people attach themselves to and appreciate, but that's something that's seen on such a global scale. It's really like a cultural phenomenon. I hope to have that again in a movie in my career. As an actor I do movies because I want them to be seen by the masses. And this is as mass as you can get. Reed: Yeah, and there's definitely frustrations and challenges that are part of it. I mean, that's life, right? It's not ever perfect. But I think when I have moments where I feel like overwhelmed by a certain scenario or, for example, there's a paparazzi chasing me or something like that and you're like 'What? What has my life become? This is not who I am. This doesn't represent me.' But then you have to sort of remember that, like I said, these things will come and go. And they're sort of high-class problems, which is great. And it's going to go away. Is there an extra takeaway for you from your experience, something that you got as being part of this phenomenon? Obviously the friendships are something that is going to be important, but maybe something that you became associated with as a result that you know you're always going to be part of that for the rest of your life? Facinelli: Yeah, it's definitely opened up my world. I've done a lot more charity events, because when you're seen by so many, I feel like you're obligated to give back in some way. And you can use that celebrity status to spread awareness for something. Once people are looking up to you for something that you've done then you're able to turn that profile into, 'Hey, well, look at this cause over here' and bring awareness to those people. So that's been a great platform for me. I work a lot with Alex's Lemonade Foundation. And I've been working with them since 'Twilight'. Ironically they were the official 'Twilight' charity, too. And I didn't even know that when I got involved with the group. Alex's Lemonade Foundation raises money for pediatric cancer. Reed: I think that was very well said. I think you heard the words 'role model' tossed around a lot. Especially by young people when you're a part of something like this. And as fantastic as that is, I think it's just any normal human being. You start to question yourself and how you're contributing and who you are in society and why you're being called this thing, this role model. Obviously on a small scale you strive to be a better person and do for yourself and for people who are looking up to you. So I am involved in a number of charities: there’s an animal charity that I work very closely with – In fact every month I foster puppies, and it sounds easier than it is, trust me! Last week my house was like a farm. I had nine dogs in my house. And I also work with Autism Speaks. My little brother's autistic so that's close to the heart. Reaser: Honestly, until very recently, I've always privately supported – financially supported – things that I care about, certain charities. I always felt like as an actor I want to be a very private person. I don't want to put my stamp on anything. I don't want to put my opinion out there in the world because I find that really can be off-putting to me, when people are trying to tell me how to live – especially if it's some actress telling me what to do with my choices in life. But I do find just politically speaking as time goes on, with what's happening in our country with women's reproductive rights and things like that – It's been a really scary year. So it's actually inspired me to want to take more action in my life. And so I'm currently sort of researching how I can try and do something. Although, like I said, I feel anxious about doing anything publicly, although I really admire other people that do it. At this point you probably feel like you’ve heard it all from your fans: good, bad, hilarious, touching, weird. But I’m guessing that in a sense, you can't ever get jaded because somebody's always going to surprise you with something new. This is going to happen for the rest of your life: some fan is going to have a story that's just going to hit you between the eyes. You're never going to see it coming. Reaser: Yeah, I don't think it ever gets old. I think it's always so surprising, you know, last night the fans and the manic passion and love that they have for these characters. And that we could make a movie that would make them care enough to camp out from Sunday. That's just like Peter was saying: it's so rare to be a part of something like that. I don't think that experience ever gets old. It's always this delightful surprise. Reed: Yeah. I'm incredibly sensitive to everything that goes on, so it couldn’t possibly get old because anything that anyone says, positive or negative, I'm always there willing to listen and take it all in. And I think throughout the years I've just become better at managing myself and what I allow myself to see and hear. But moments like like Comic-Con, we're here to interact with the fans. That's what this is. And so I think we're all happy to do it and happy to listen to what they have to say and happy to connect with them in whatever way we can. Facinelli: I felt like that for four years I've been asked almost every question I could possibly answer – although I'm waiting to be surprised! But most of the time they are repeat questions. But I don't mind repeating the answer because they're hearing it for the first time. They're hearing that answer for the first time. So even though, for me, I might've answered that question a hundred times, to have them listen to that answer and have them digest the answer, it's an interaction that's fresh and new.